Welcome to our brand new, fresh and forward, Go To Places Monthly. Thanks to our design manager, Jonah Blum, you can now actively participate in every issue through facebook! Post articles, ideas, commentary and pictures – be a part of all the stories we bring to you! Let us know what you think, let us know what you want to know about. Partner with us and let’s see what happens, it is going to be a very exciting year. 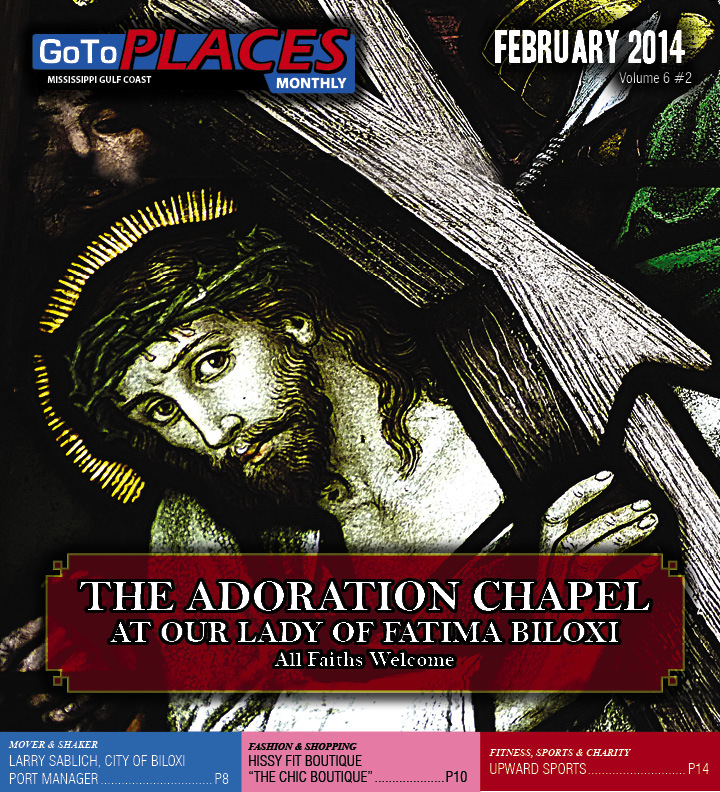 This month we bring you a guided tour of the magnificent adoration chapel that recently opened in Biloxi at Our Lady of Fatima Catholic Church. Find out how this labor of love came to be through the fearless determination of their pastor and the tremendous generosity of the parishioners. Meet Larry Sablich, Port Manager for the City of Biloxi, who is our February Mover & Shaker. He has the enormous task of presiding over all the Biloxi fishing piers and harbors yet actually knows most fishermen who come and go by name. Parents be sure and check out the article on Upward Sports. They partner with churches all over the country to provide the safest, most enjoyable sports programs for your kids. Registration for soccer is going on right now.